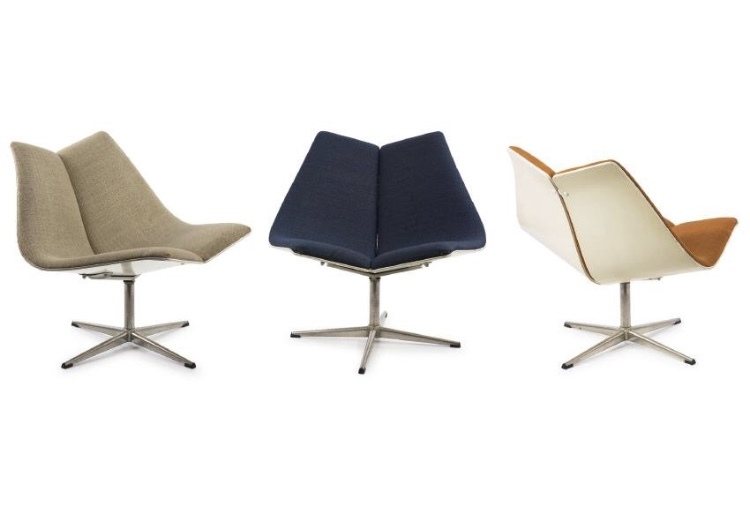 Montreal Expo Chairs manufactured 1967 by Ebene LaSalle. These sculptural svivel chairs were designed for the 1967 Expo in Montreal hence the name Montreal Pavilion Chair with painted molded plywood frame and a chromed base. Create by danish industrial designer Christen Sorensen. (1921-2015)Graduate of Denmark’s famed Kunsthandwaerkerskolen, or School for the Arts and Crafts, Sorensen studied under a who’s who of Danish modernism, including Hans J. Wegner, Borge Møgensen, and Bender Madsen. Upon graduation, he opened his own studio; furniture designed and produced there were exhibited at Milan’s Triennale in 1955. Sorensen moved to Montreal the following year, working on major commercial and transportation projects, and eventually becoming involved in the design of three pavilions in the legendary Expo ’67. 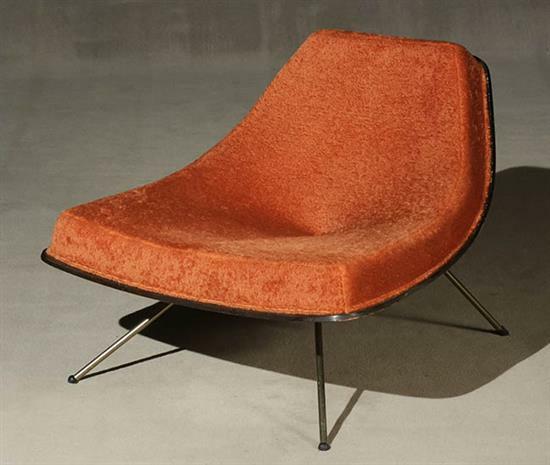 Also known as the "Canadian Coconut Chair,"
Having a bent plywood frame with original light-orange pile upholstery raised on a metal splayed-leg base. A Canadian icon from the Mid Century Modern era by architect A.J. Donahue. Affectionately known as the "CANADIAN COCONUT CHAIR" or the "WINNIPEG CHAIR" Donahue produced these lounge chairs in the late 1940s & early 1950s with the help of his architectural students at the University of Manitoba. Features a bent plywood shell with a metal rod base and rubber shock mounts. Originally the chairs exterior plywood shell was left exposed but this particular chair has recently been fully re-upholstered by the previous owner. This was done most likely to hide surface wear that had occurred over time to the exposed part of the shell. Regardless...a super comfortable chair with tons of Modern era character and unique history as it is estimated that only around 200 units were ever produced. 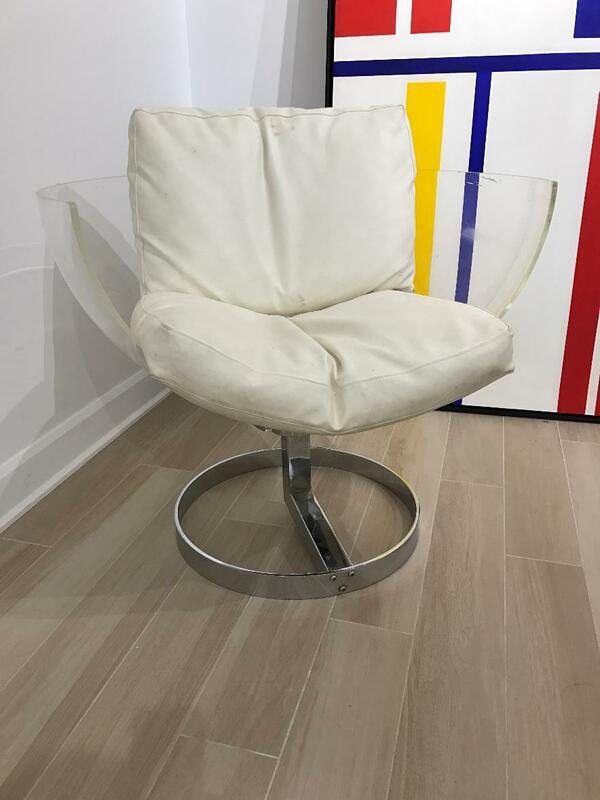 Canadian, industrial designer, 1970s, clear Lucite, two white leather slip cushions, white powder coated steel swivel base, with U.S. and Canadian patents, otherwise unmarked. 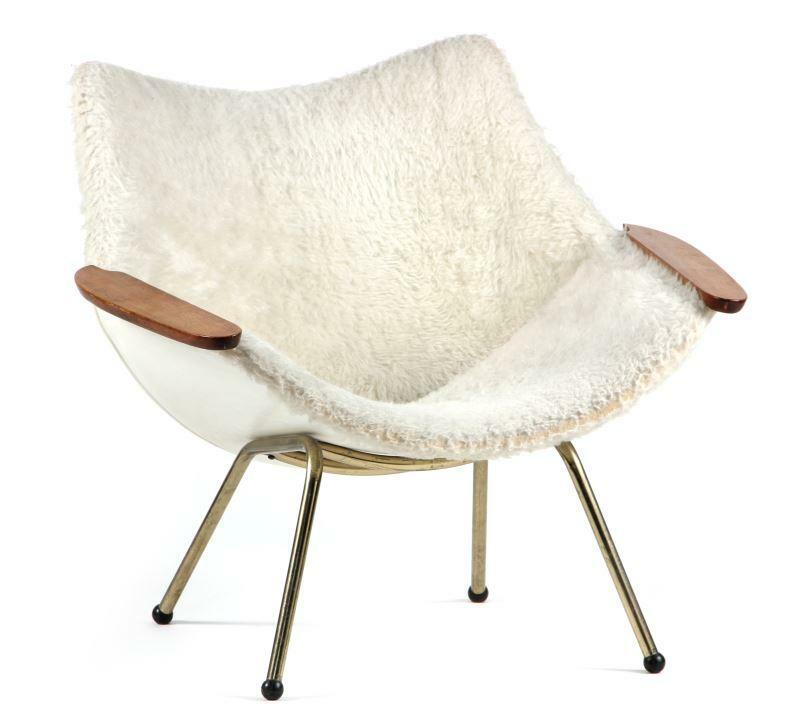 1950s, similar as the "Canadian Coconut Chair," white mohair and naugahyde upholstery with oak arms and four tubular legs with black ball feet, unmarked.